Hung on the wall in our spare room (still, I cannot believe we have a spare room) is one of the few pieces of art I own. It was bought during a bad time in my life. I watch my reflection in the frame’s glass and remember the story; mended by a professional on Stoke Newington High Street after a final argument shattered the glass protecting Reculver towers and the sandstone cliffs, the shining rippled mudflats glowing in the sunset. It sat stacked in a corner until I moved out and moved on. I worried it would smash again when I piled it up in the van. It survived and I’m glad I still have it. My partner is ambiguous as to its artistic quality, but she tolerates it, knowing it has meaning for me. I like it. She’s been to Reculver with me and said she liked it, (albeit in a bleak way), as we pointed at the darting sand martins with my mother, saw a kestrel strike, watched small rabbits tremble under Norwegian stone. Reculver Towers was bought on Harbour Street in Whitstable, Kent, from The Loupe Gallery (now disappeared). Pencilled in the bottom left hand corner: 63/250. Photographed by artist Angus Fraser, who’s professional website presents a stark image of the Margate tidal pool. Reculver Towers, is one of many unpeopled Kent land-and-seascapes. Tidal Pool I. Three Boats. Seasalter Beach (this one, stark black-and-white, reminds me of a walk with my old school friend Ben and I want to be back out in the stinging Swale wind). Margate Harbour. Fisherman’s Huts. Sunset, Whitstable. Tidal Pool II. High Tide, Whitstable. Jetty, Whitstable. Whitstable Bay. Harbour, Whitstable. The Street, Whitstable. Isle of Sheppey. Groyne, Detail. Herne Bay. West Beach, Whitstable. Water Park. Sandwich Bay. Beach Huts. Whitstable, 9pm. Broadstairs. Canterbury Cathedral. Clearly he found something of interest in this area before moving on. Whitstable especially (the cliché!) I think my picture a cut-above the dense mass of provincial art that crams the boutiques of my hometown, but perhaps I’m blind to the realities. I click through the images on the Loupe gallery’s website, ignoring irrelevant shots of Brighton or the misty Irish coast. ‘About’ informs me corporate clients include Vodafone, John Lewis and Esso. These places contained within the photographs, I’ve been to all of them. 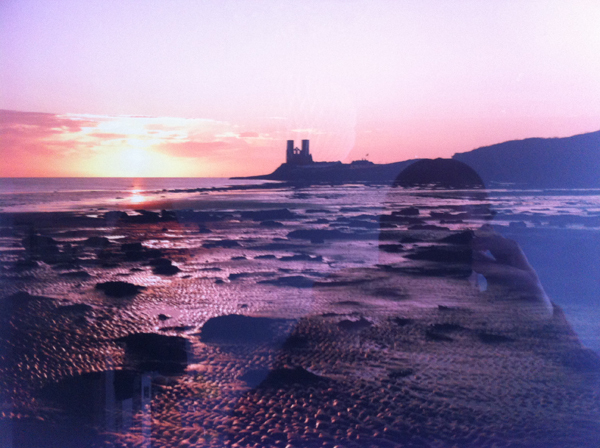 I look at Reculver Towers hanging on my spare wall. I’m going there again, soon. I’m trying to remember what I did there before. These chocolate brown birds, swallow-like, darting in and out of burrowed sandstone holes. Sand martins fleeing the heat of North Africa and the Mediterranean to take refuge in the more hospitable climes on the North Kent coast. Did they flit above this water as the bombs bounced on the waves? The remains of the Roman fort and the ruined 12th century church are retirees in a coastal home, watching their own past crumble into the sea. Propped up by imported Norwegian stone they battle against nature, time and indifference, a castrated castrum. Spring sunshine shines on young toddlers with plastic sand buckets as they splash through rock pools. The rotten-salt smell of seaweed clogs the nostrils, keening herring gulls wheel overhead and the martins pepper the sky. Reculver, being eaten away by the sighing waves. For me this is time away, a breathing space, respite, not London. I can’t say what year this is. Regulbium is a Roman fort on a Saxon Shore. Once an island fortress, separated from the mainland, connected to us now by centuries of silt. Imagine this land not being here. If the sea has its way, it will be gone again. This was an important place, covering the mouths of both Thames and Medway. The Romans left and the fort fell into ruin. The whispered-about infant sacrifices didn’t do their job. Anglo-Saxon kings followed. A monastery appeared, a church rose. Bede praised the abbots who became Archbishops of Canterbury. Once, here, there were councils presided over by Hlothhere. By the 10th century the monastic life dwindled. Viking activity was watched curiously by the sea. Coastal erosion led to a village abandoned by the end of the 18th century. The church was demolished, only the towers remaining as a navigational aid and magnet to coastal walkers. They stand still, spearing the sky and the imagination. Punctuation marks in an otherwise empty sky. They remain, in some form, altered and adjusted many times. I know the sea will take the towers eventually; scrub the land clean of the Romans, Saxons, Vikings, Normans, the tiny lives and the small scale tourism. The sand martins will have to nest elsewhere. My trip down here will be washed out to sea. Britain is a ghost story. Tales from the last century tell of children’s cries on the wind. The gales here are fierce, and if I try I can hear the wailing myself. The audio track is crowded with screaming babies, trilling piccolos, the murmurs of bomber pilots. In 1966, skeletons of infants were unearthed under the site of the Roman barracks. The websites that abound mapping the supernatural geographies of Britain and Ireland suggest this may have been some grisly rite. It’s wishful thinking. On a grey day standing where the country just stops, looking out over the caravan park being whipped by the wind, sacrificial hauntings are a welcome bit of excitement. It’s a great story after all. Every time I’ve been here, even when the tourists are in full force, it feels empty, desolate, compelling. A perfect place for monastic chastity, silent reflection, child murder. People are intimidated by these landscapes. Janet Cameron’s ‘Spooky Ghost Stories’ boldly states: People really believed in past times that tossing small babies into the foundations of buildings helped protect them and their occupants from evil spirits. She backs this up with precisely no evidence and hopes we’ll just trust her. Other theories suggest that the children’s cries are those of the drowned from various shipwrecks that have littered this coast across the centuries. Why the ghosts of adults are not similarly aggrieved, no one explains. British stiff upper lip even in the afterlife? The child remains are real though. A report by Brian Phelps of the Reculver Excavation Group from 8th September, 1966, collected online by the Kent Archaeological Review, entitled ‘Ritual Burials at Reculver,’ reported: The major excavation at Reculver for 1966 ended on 8th September with the dramatic discovery of the skeletons of three more babies buried in the foundations of a substantial building on the west side of the Roman fort. Two quite random cuts were made through the walls of this building to examine its construction when the burials were discovered. Each infant had been no more than a few months old when buried. The total of infant burials from the site now stands at eleven, six of which were certainly ritual foundation-burials of Roman date. Again there is no proof that the remains must be sacrificial rituals, but this report certainly does back up some of the wilder and grislier claims found in the exclamation marks, oozing fonts and bad grammar of the haunting websites. As a child, on my trips to more remote parts of the UK with my dad, I always imagined those mythical white bearded druids setting about a baby with a knife, not the noble Romans. Anti-Celtic propaganda settled in my child mind; the Romans are what we base our civilization on, the Celts were the savages with wild hair and hippy tattoos. Not all of the child remains are Roman, however: Of the other five one at least was buried in post-Medieval times. Within ten feet of one of the skeletons just found was a small baby’s feeding-bottle which had been placed on its side in the floor of the building, but it cannot with certainty be associated with the burials. Whatever the truth (which I’m not hugely interested in), the stories here write themselves. And it is a good story. For my part, whenever I visit this place I feel a queasy sense of having stepped out of time, somehow always older but never having left. But this is only ever a place to visit, not to stay; imagine actually living here. I feel an appealing pull but I lack the resolve. I’m still too in love with London despite the abuses it heaps on me. Summer in 2013, another trip to Kent with my partner. We take a walk below the crumbling sandstone cliffs with my mother, who’s been here a million times but shows no sign of tiring of it. Like always, it’s reassuring to see the sand martins, smaller than their house dwelling cousins, feeding on the wing as they take down flying invertebrates. The cliffs are riddled with their burrows. ‘Do you remember that school trip we took here when you were still at Swalecliffe?’ asks my mum. At first I don’t, then something’s slowly fades back into view. My images from that trip (around 1990, I’d guess) match today, though I recall it being colder, wetter, then. Nothing unusual about that. Maybe more run-down, the information centre tragic in that way that can only be achieved by being situated on the forgotten edge of a land. I remember clipboards, cagoules, rooting around in rock pools. Something has changed since my last visit though. Were things cleaner and neater? Maybe. The church towers are weathered and cold and the wind assaults us, waters the eyes, makes me alert. I feel like we’ve stepped off the page. Business almost as usual. We walk away from the towers along the cliff tops, now looking somehow more managed and more wild at the same time. A straight path of green grass is flanked on either side by a swaying and whispering masses of managed meadow. As we stroll, I see skylarks undertaking their famous vertical sky displays, wings tipped white. The collective noun for the skylark is an exaltation, which only sounds strange if you’ve never seen the bird. These larks, this swaying plant-life, they weren’t here the last time were they? I ask my mother. It’s a nature corridor, she says. She likes buzzwords. I didn’t think that was the right term but it feels right. Effort has been made to encourage the natural diversity of the area, something so unexpected it fills me with a genuine happiness. I expect everything to be worse than I remember, always, so it’s nice to be proved wrong. In the distance stand the black outlines of three figures, light and foliage filling the gaps where their bodies should be. I approach the two dimensional figures. A woman in Roman dress. What can only be an oyster fisherman with his pots. A WW2 pilot. I find out later the pilot is Warner (‘Bill’) Ottley, who flew on the Dams Raid and was shot down near Hamm. Bill Ottley’s family lived in Herne Bay, as does my father. One of the Dambusters. A national hero. I took a filtered photograph of the bench out of duty more than anything. I sit briefly on the damp wooden frame. My mother stands near the cliff’s edge and looks out toward the horizon. Things could change, but we were still trapped by the past. 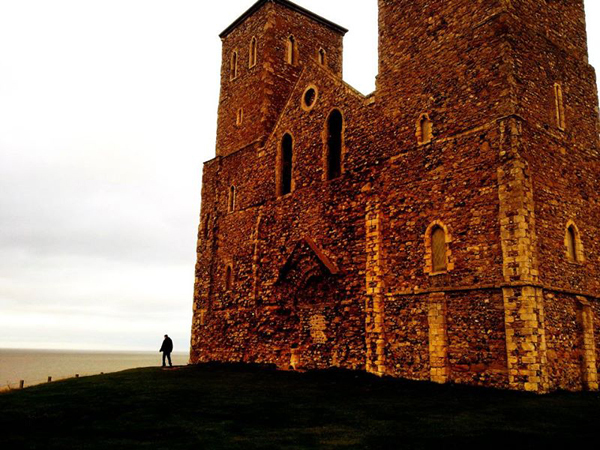 Reculver retains a residue of fame for its role in World War Two, a war that’s now becoming as much a part of our ingrained mythology as Arthur and his knights, the Battle of Waterloo, or Corineus slaying Gogmagog on the Cornish coast. Mortality overtakes the first-hand accounts, but stories, half-truths and legends will continue. In May 1943 Barnes Wallis held trials of the ‘Upkeep’ weapon in the area, developing the bomb that was used in the RAF’s Operation Chastise to obliterate German dams. Reculver was chosen for its remoteness; though one has to consider the thought that the church towers would have been obvious signposts as to where the bomb tests were taking place. Two inert prototype bombs lay inert in the marshland beyond the sea wall until 1977 before finally being removed by the Army. Twenty years later, when I was fourteen, more prototype bombs were recovered along the shoreline and this time turned into heritage; one now sits a few miles away in the Herne Bay Museum and Gallery, one at Dover Castle, and one at the RAF museum at Manston on the Isle of Thanet. Up the coast, in Herne Bay, three minutes from my father’s house (itself now four doors down from the blue plaqued memorial to Marcel Duchamp’s brief stay in the town in August 1913) stands a statue of our man Barnes Wallis. Sculpted in bronze by an American, Tom White. Why was a sculptor from Maine, USA, commissioned to erect such a memorial to one of our national heroes? Looking at his website unearths a man on a Holy mission: Tom’s work can be found throughout the country and around the world, each commem­o­ra­ting another chapter in a brilliant career that began as an inspi­ra­tion of God and testament of His gift. Sir Barnes Wallis, the destruction of the Ruhr, prototype explosives watched by the ghosts of Roman sacrifice. All set in bronze, a birdshit-encrusted idol approved by God. They call these things portrait benches. 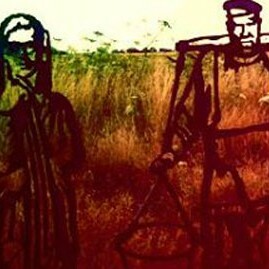 The three figures standing in outline atop the sandstone cliffs, among the swaying wildflower meadows. I’ve never come across such a thing before. There’s no explanation, no water damaged information board. I like that. So what is a portrait bench? I wonder who did the voting. I’m uneasy with memorialising people who flattened German cities, though I suppose it was necessary. Who would I have voted for my own personal portrait bench? Roman baby killer, naughty Darren, a hooded ASBO youth. I went on to discover that portrait benches now litter the UK. They’re intended to become a natural part of the landscape, and I think in time that that is possible. I know, for example, that the Roman ruins and the church towers are man made. And we tend to think of man made as unnatural, by which we mean we ourselves are unnatural. But on a long enough time line anything can become just part of the landscape. The project was set up by a charity called Sustrans, a charity commited to ‘bringing new walking and cycling routes that bring the National Cycle Network into the heart of communities across the UK.’ And that’s a good thing, I concede. So in Everton and Kirkdale we find Molly Bushell, founder of a toffee firm; in Sleaford a retired dental surgeon with his bike; Spike Milligan is rendered in 2D in Hastings and Bexhill. On the Carlton-le-Moorland and Bassingham Pathway, a WW2 Land Girl and Lincolnshire red bull. It occurs to me, this could be the perfect crack brained book idea to pitch to a publisher: Journeys to the Portrait Bench. You’ve got to have a hook these days. And I would like to see the other portrait benches, see if they’re as in such a depopulated and windswept spot as my Reculver bench. I wonder if they set off the same chain reactions of memory and musing. I wonder if people really notice them, these Corten steel ghosts. I visit Reculver at least once a year. It’ll be nice to see the portrait bench age as I age, then outlive me, eventually to become part of the landscape and the ongoing story. Gary Budden is the co-founder of independent publisher Influx Press and works as a fiction editor for Ambit magazine. He has been published by, and has work forthcoming in, The Quietus, Unthology, Under the Radar, The Cadaverine, Annexe, Prole, Rising, Boscombe Revolution, Galley Beggar Press and more. He lives in London.